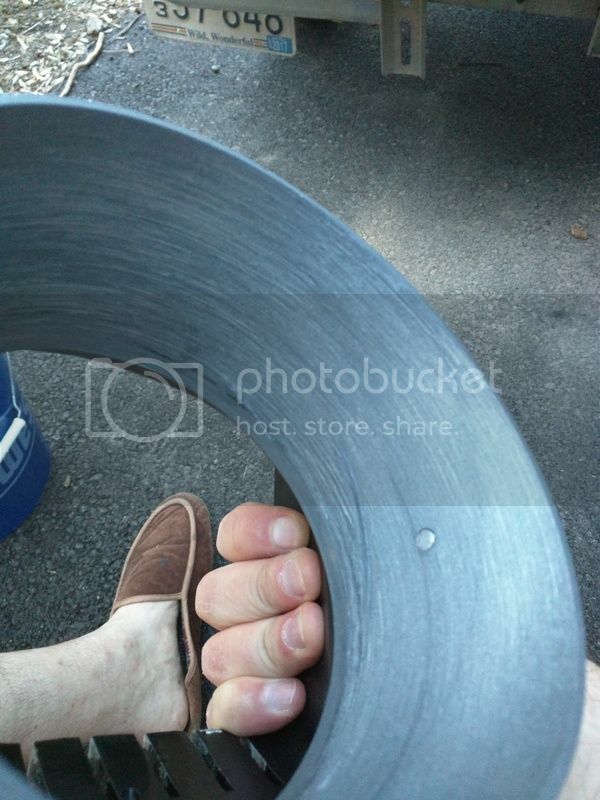 shim and sharpen the impeller lately? Impeller still looks good and I checked the clearance late last year. Will pull the foot and check it again and clean up the impeller though before I take it back out. Good idea. What do you think about trying to beat out the little hook I have? The more I think about it, I think that's what is causing some top end loss. It's right at the transom in front of the jet foot, probably from hitting rocks. It's not terrible and not the entire length of the transom, maybe 12" or so. Just don't want to beat out the hook and end up weakening the hull in that spot. I'd fill the dents with Bondo & see if it makes a difference. Bondo is cheap & can be sanded away if you want a more permanent fix later. 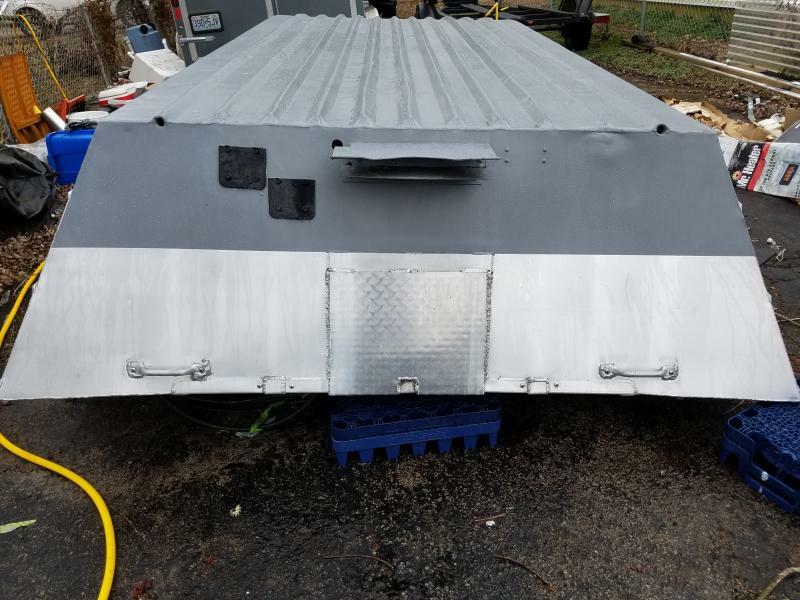 How good will that bond with aluminum compared to something like JB waterweld? I used this on my boat to patch a hole in the side wall. I'm no body work expert and it still came out looking nice. Little touch up paint and you can even tell it's there. I know there are other factors to consider like your boat being riveted/thin and flexing a lot. with any patch filler - aggressive tooth is the key for a successful patch. pattern to get as much rough surface as possible to grip and hold the filler material. if you sand smooth with the orbital sander, your chances of a good bond is decreased. sand the filler smooth and feather the edges after the filler has fully cured. then, proceed with the appropriate cleaning, primer and paint. I beat as many of the dents out that I could from the rock I hit last summer and the years of river abuse. Had a hook at the transom I straightened. What I couldn't fix I used metal 2 metal filler on and then painted with Wetlander. It came out looking almost like a new bottom. only problem is, this tracker is .063 aluminum. Im not sure id want to touch it for fear of cracking/creasing/etc. and I dont see 5 mph from that damage. are you sure that the motor isnt just getting broken in and not as tight as when you first rebuilt it? are you turning the same rpm as before? This is what I'm afraid of as well. Not sure on the motor being broken in and loosening up a bit. Certainly could be. RPM's are the same as before. When it was first rebuilt I was getting 26 up river by myself and no gear. Now by myself and minimal fishing gear up river I'm about 20-21. 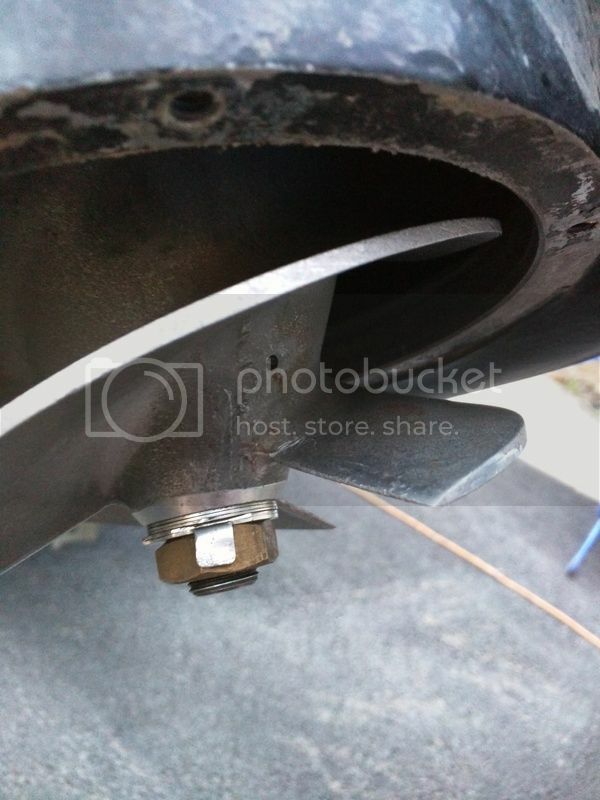 I'll tear the foot off and check the impeller and clearance before I take it back out. The hook on the transom is the only other thing I can think of that would be causing my issue. Thanks, but I'm good on the motor for now. I have a few dents that size on a 1752, including one on the outside edge that throws a little extra spray on plane. I only lost maybe couple mph at most off the original top end of 26 mph. before you risk re-forming the aluminum. Here is my liner and impeller. 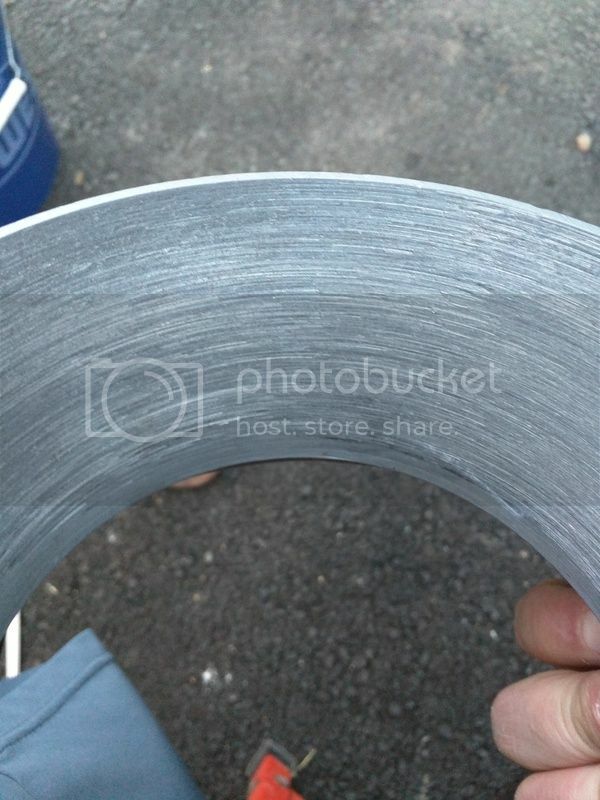 Dressed up the impeller and the liner looks like normal wear to me. No big gouges or anything at all. The impeller is shimmed nice and tight as well, .015 all the way around. 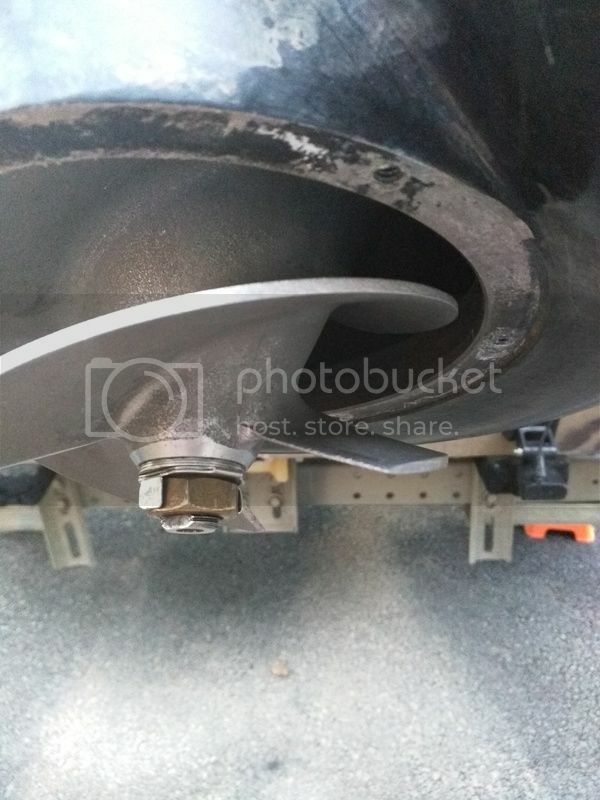 Any good source for the impeller nut keeper? Broke one of the ears off of mine getting the impeller off. I have a spare, but it used and I'd like to get a new one to put back on. Marineengine.com has them for $12 a piece. Wasn't sure if they were cheaper anywhere else? And you're sure the gate is operating fine? You can get them from OBJ for about $2, but I don't know how much the shipping would cost. Might try eBay. Yes. I put my throttle all the way open and then tried to pull the gate back with my hand. Nice and snug, can't get it to move back at all. Anything else I should check with that?